I dedicate this recipe to my dearest grandmothers, who were both very memorable women. I've had so many great moments with them, which also include incredible food memories. They definitely have a large part in my cooking and how I create my recipes. Many of my recipe roots go back to my grandmas. I think it's a wonderful skill when you can make delightful food out of very simple and affordable ingredients. I get so excited when I manage to make my recipe super tasty, easy to make and cheap. 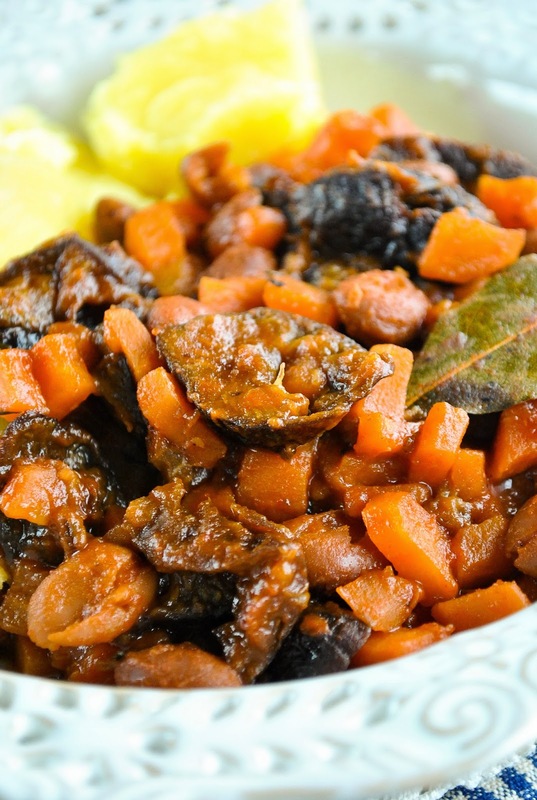 This hearty bean and plum ragout is one of those recipes. When I think of a ragout, I usually imagine a thick beef and carrot stew. But you can make a luscious ragout without any meat. 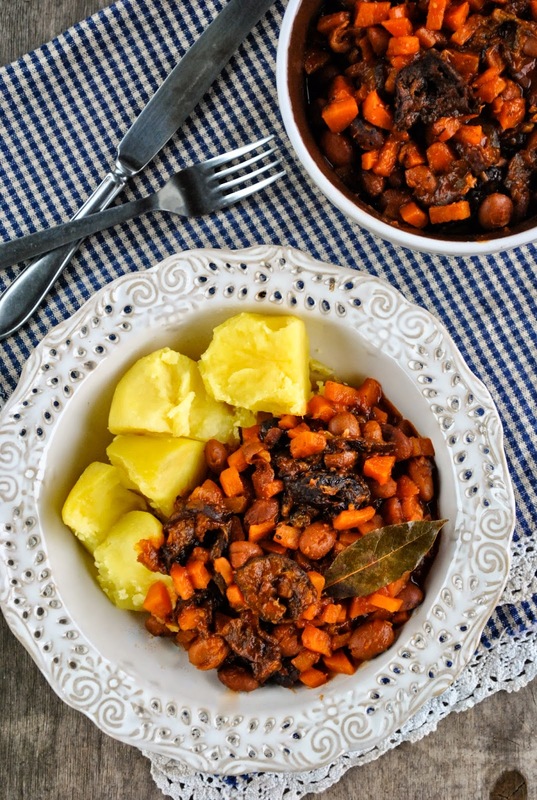 Sweet carrots, rich plums, hearty beans, soury tomato and flavorful bay leaves meet in this recipe. One great ragout just has to contain bay leaves! I've eaten this ragout with pasta and with potatoes. It was delicious either way, but my favorite combination was with potatoes. But why plum ragout? I've wanted to create a vegan ragout recipe for quite some time now. 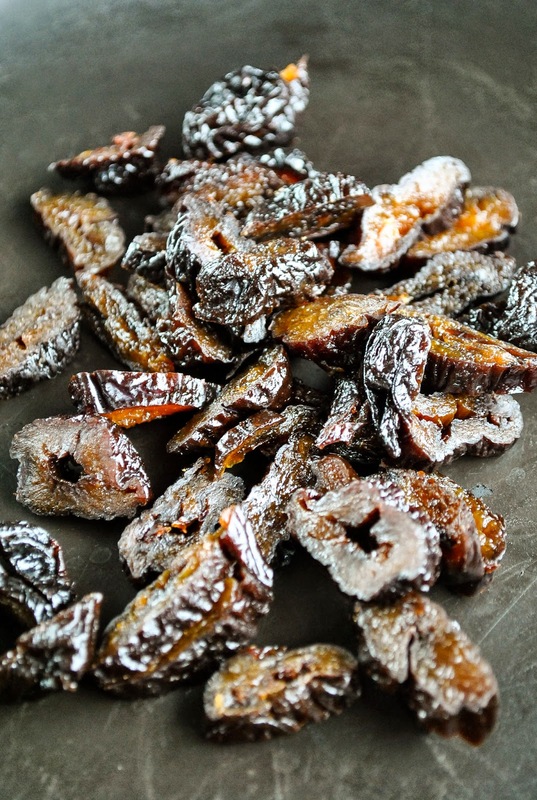 It just needed this one special ingredient and dried plums suit really well with their taste and texture. Dried thyme and bay leaves really help to deliver tons of flavor. 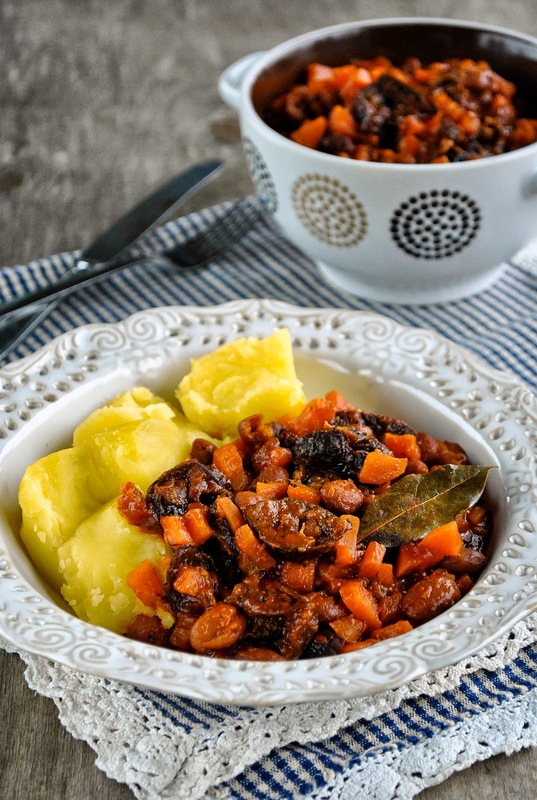 Serve this ragout with pasta or potatoes or any other vegetable or grain and you will have a fabulous main dish. And the best part is that it's so easy to make, tastes really good and all the ingredients are affordable and widely available. These kind of recipes always become my favorite and will be in heavy rotation in my kitchen. Heat up a thick-bottomed pot. Add oil, chopped onions, cubed carrots and quarter of teaspoon of salt. Stir and cook for 3-4 minutes. Add sliced plums and pepper. Stir and cook for a couple of minutes. Add drained and rinsed beans, bay leaves, thyme and paprika powder. Stir and cook for a minute. Add hot water, the rest of the salt and let it simmer on a medium heat covered with a lid until the carrots are soft. Add tomato juice, stir and let it simmer for another few minutes, until the ragout has thickened a bit. Serve.